. : Farm Forest Line - Native forest silviculture :. Using existing native forests on farmland for timber production is often overlooked in the rush to plant more trees. The table below shows that there are over 11 million hectares of privately owned native forests in Australia. These forests cover a wide range of forest and woodland types, many of which include commercially valuable timber species. Eucalypts, including many of the more valuable timber species, dominate many of these forests. But there are other commercially valuable species including Acacia, Callitris, Casuarina, and many tropical hardwoods, growing in native forests. Although much of Australias native forest resources have been cut over for timber in the past, and neglected since, there is potential for private landowners to manage these forests for timber and other values. Recent experience in Queensland and Tasmania demonstrates the benefits of managing private native forests for timber production and other products and services. In Queensland, sawlog production from private native forests recently exceeded that from public forests. In Tasmania, approximately 30 per cent of the states total sawlog and pulpwood production comes from private native forests. Bill Kerruish, is a harvesting researcher who has worked with the Commonwealth Scientific and Industrial Research Organisation (CSIRO) for many years. He suggests that farmers who have a mature, well-managed native forest might be able to generate as much cash in one week from strategically managing their forest, as they could in 50 years of tree growing. It has also been suggested that thinning regrowth eucalypt forests can enhance a forests biodiversity values as well as its future timber valuesee Murray and Thompson 2000 in Additional information. The silvicultural management options available to farmers with native forests are many and varied, and there are many aspects to consider when developing a forest management plan for a native forest. It is important to maintain a forests genetic integrity and to make sure that the ecological processes that support regeneration, wildlife habitat and soil protection are not threatened. So, when native forests are harvested, growers must use techniques that offer the best chance of achieving successful natural regeneration or enhancing future timber value. Clearfelling, gap logging, shelterwood systems and selective harvesting are all options that may be considered. For the light-demanding eucalypt species, selectively harvesting individual trees rarely allows for healthy regeneration. But in the tropical rainforests, this method may effectively mimic natural gap formation. Most state governments provide guidelines for managing and harvesting native forests that require landowners to submit management plans before undertaking any operations. 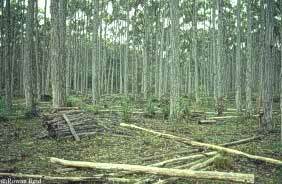 The aim of these guidelines is to ensure that timber harvesting in done in a sustainable manner and that the forests are not inadvertently cleared for agriculture. Landowners must contact their relevant land management agency for information about the procedures and options available.